Samos Monastery was originally built in the 6th century when "Saint Martin of Dumie" started the promotion of the monastic life style in Galicia. At its inception, the monks of Samos followed the monastic rules laid down by Saint Frutuoso and Saint Isidora, but after the 10th century this regime was changed to that of Saint Benito (Benedict) of Nursia. 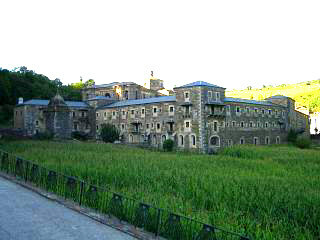 To the left, a view of the monastery building as seen when approached from the Sarria-Lugo route. To give some idea of scale, the lush green grass in the foreground is actually 5 foot high sweetcorn. The monastery and its inhabitants were beneficiaries of donations from the monarch and noblemen of the time who believed that this support would help ensure their places in heaven. But things were never easy for the monks. In the 8th century they were persecuted during the muslim invasion and during the French occupation the monastery was plundered. Expulsions and occupations were common as were fires which wreaked havoc in 1533 and more recently in 1951. Around the time of the 16th century, some of the senior clergy from the monastery left to spread their teachings further a field as the monastic life, and its place in Christianity, was at its peak. Life did however get harder as the monks were financially and physically persecuted and, in 1835, the remaining monks were expelled and Samos monastery abandoned. In 1880, 12 monks returned to Samos and the order's presence has been continuous up to this day. The monks still adopt the life promoted by the "Benedictine rules" of the 6th century and involve themselves in both manual and intellectual pursuits. These involve, artisan, restoration, librarian and publication work, as well as gardening and hospitality, which is extended to both pilgrims and those wishing to follow or contemplate a religious life. Anyone who feels the draw of monastic life is encouraged to contact Samos monastery directly. 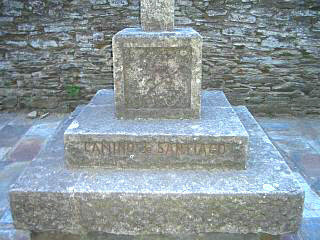 Below right, the base of a Galician cross or "cruceiro", which stands close to Samos monastery and has the insignia, "Camino de Santiago" carved into its plynth. This indicates the buildings position on one of the pilgrims routes. If you like big and impressive religious structures, along with a scenic drive to reach them, then Samos and its monastery will not disappoint. As a note of caution, Samos is some what out of the way and although the main road that runs through it is good, it is not street lit at night. The nearest significant town to Samos is Sarria which is famous for antique sales/auctions and also has its own (smaller) monastery, so the combining of these two destinations could punctuate the journey back to Lugo. Samos is also within travelling distance of "Monforte de Lemos" and guess what, that has a monastery too.